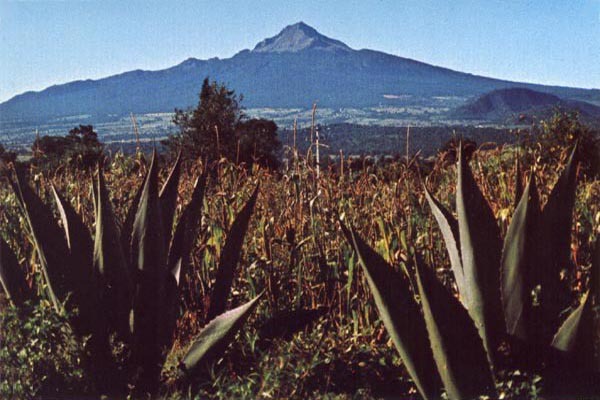 Who was Doña Maria, La Malinche? "We are the only persons who can answer the questions asked us by reality and our own being." “They too carry about with them, in rags, a still living past." "It is not difficult to understand the origins of this attitude toward us. " "But it is always an ambiguous if not a contradictory image: we are insecure . . . We attract and repel." "The European considers Mexico to be a country on the margin of universal history, and everything that is distant from the center of his society strikes him as strange and impenetrable." "The peasant, . . . In every country he represents the most ancient and secret element of society." "Woman is . . . an enigmatic figure." "She is an enigma." a living symbol of the strangeness of the universe and its radical heterogeneity." "Woman" is "not only an instrument of knowledge, but also knowledge itself." the worker: "Capitalism deprives him of his human nature." "the fragmentary man [person] of our time . . . the modern worker lacks individuality." "It is said that we live in a world of techniques." "salaried" but "lacks a true awareness of what he creates." "In many instances these phantasms are vestiges of past realties." "All of our anxious tensions express themselves in a phrase we use when anger, joy or enthusiasm cause us to exalt our condition as Mexicans: "Viva Mexico, hijos de la chingada!" it is a challenge and an affirmation, and an explosion in the air. chingarse means to make the fool, "molest , censure or ridicule"
"The verb denotes violence, an emergence from oneself to penetrate another by force." "to lacerate, to violate, to injure"
"The magic power of the word is intensified because it is prohibited." "No one uses it casually in public." If they are capable humans can create meaning out of the senseless horror of a nightmare which is our experience of reality. We are myth makers, story tellers, carriers of the ancient traditions, neither authentic or Spanish -- neither white nor black. La Malinche; shame of the conquest -- the Amerindian woman who gave herself to Cortés. The Mexican in opening up to the world-- through the alleged betrayal of La Malinche --was untimely ripped from the world center. "The Chingada is the violated Mother. The symbol of this violation is doña Malinche, the mistress of Cortés." If the Chingada (Aztec) is a representation of the violated mother, it is appropriate to associate her with the Conquest, which was also a violation, not only in the historical sense but also in the very flesh of Indian women." 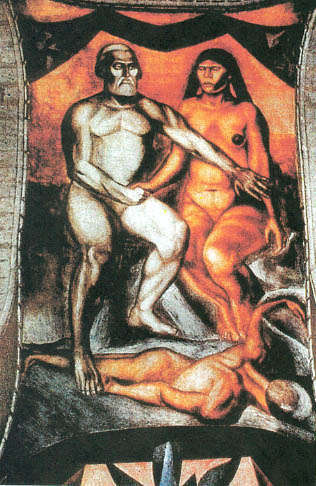 "The symbol of this violation is doña Malinche, the mistress of Cortés." Aztec -- Mixtec -- Toltec -- Olmec -- Chichimec -- Mayan diversity are all aboriginal peoples of today's Mexico. We hear a double answer. It is no secret to anyone that Mexican Catholicism is centered around the cult of the Virgin of Guadalupe. In the first place she is an Indian Virgin; in the second place, the scene of her appearance to the Indian Juan Diego was hill that formerly contained a sanctuary dedicated to Tonantzin , "Our Mother," the Aztec goddess of fertility. "This phenomenon of a return to the maternal womb, so well known to the psychologist, is without a doubt one of the determining causes of the swift popularity of the cult of the Virgin." "The Catholic Virgin, is also the Mother, . . . . [ who exists ] to provide refuge for the unfortunate." "It is astonishing that a country -- should conceive of itself only as a negation of its origins." "In this shout we condemn our origins and deny our hydridism. 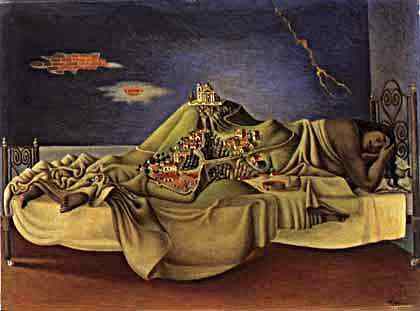 The strange permanence of Cortés and La Malinche in the Mexican's imagination and sensibilities reveals that they are something more than historical figures: they are symbols of a secret conflict that we have still not resolved." "The Mexican condemns all his traditions at once, the whole set of gestures, attitudes and tendencies in which it is now difficult to distinguish the Spanish from the Indian . . . . The Mexican does not want to be either Indian or Spanish. Nor does he want to be descended from them. He denies them. And he does not affirm himself as a mixture, but rather as an abstraction: He is a man. He becomes the son of Nothingness. "This attitude is revealed not only in our daily life but also in the course of our history, which at certain moments has been the embodiment of a will to eradicate all that has gone before." “They are impalpable and invincible because they are not outside us but with in us…they are supported by a secret and powerful ally, our fear of being . . . .
“Mexico is all alone, like each one of her sons. "The Mexican and his Mexicanism must be defined as separation and negation. And, at the same time, as a search, a desire to transcend this state of exile." In sum, as a vivid awareness of solitude, both historical and personal. "History, which could not tell us anything about the nature of our feelings and conflicts, can now show us how that break came about and how we have attempted to transcend our solitude." "History, which could not tell us anything about the nature of our feelings and conflicts, can show is how that break came about and how we have attempted to transcend our solitude." The modern worker lacks individuality. “Slaves, servants and submerged races always where a mask. “Each country has its own ‘opaque’ words. Goddesses of the ancient world and "Guadalupe is pure receptivity." 1, from hermetic; hidden (also Hermetic ) of or relating to being sealed -- insulated or protected from outside influences:-- derived from an ancient occult, a tradition of hidden, sealed, or esoteric knowledge encompassing alchemy, astrology, and theosophy. • esoteric; cryptic: obscure, an hermetic potient, spell, or curse. hermeticism –hidden, cryptic or obscure--insulated or protected from outside influences . ORIGIN mid 17th century: from modern Latin hermeticus, from Hermes [ the planet Mercury ], identified with the Egyptian god Thoth, regarded as the founder of alchemy and astrology.